For many centuries, a deep appreciation of insect song has been evident in Asian cultures, especially in China and Japan, where insect musicians have long been celebrated by the poets. In ancient times, city dwellers would take autumn vacations to remote areas of the countryside in order to appreciate particular insect songs or choruses known for their inherent beauty. By the sixteenth century, mushiya (insect-sellers) were commonly found in the outdoor markets of cities, and it became fashionable to keep singing crickets and katydids as pets, for the sheer aesthetic pleasure of hearing their songs through the winter months, long after they have become silent out-of-doors. 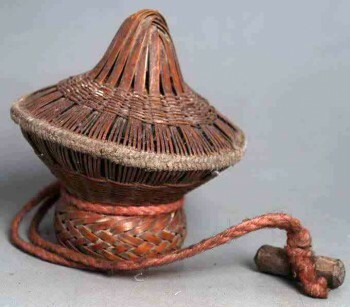 The finest singers were given endearing names that described their songs or habitats, such as jin zhong (golden bell), jiao ge-ge (singing brother), kusa-hiban (grass lark), yabu-suzu (little bell of the bamboo grove), and aki-kaze (autumn wind). These names demonstrate an aesthetic sensibility that is well refined. In comparison to the Asian fascination with insect songs, which remained prevalent through the 1800s, our culture shows far less refinement. Certainly, we perceive and enjoy the pulsing choruses of late summer and autumn, but aside from a few outstanding species (such as the Common True Katydid and the Spring and Fall Field Crickets), most of us seem perpetually confused about which insect is making which sound, and we have no established aesthetic that helps us enjoy the beauty and communicate our appreciation to others. These are exciting times. As people far and wide come to a full appreciation of our insect musicians, interest will explode, and a new industry will be spawned. Before long, hundreds of thousands of Americans will be tuned in, and countless people will be planning outings and vacations to experience the glory of the insect soundscape. We are confident that this will come to pass, and we invite you to join in the fun! The full appreciation of insect songs lies in the province of the young, who still have youthful hearing with full high-frequency response. But even youthful ears can be strained, as certain insects sing at the very upper register of human hearing and often beyond. Sadly, as we age, most of us lose our high-frequency sensitivity, and by middle-age or beyond, many of us can no longer hear the highest singers. What was once a meadow or hedgerow resounding with the high-pitched trills, chirps, shuffles, crackles, and ticks of insect singers may be transformed into a quiet pastoral scene, punctuated only by the soft rustle of grass swaying in a gentle breeze. The numbers don’t lie. Youthful human hearing extends from around 30 Hz to as high as 20,000 Hz. Frequency range is best understood in terms of octaves, which involves a doubling of the frequency. Thus, human hearing covers a little more than nine octaves approximated by the following ranges in Hz: 30–60, 60–125, 125–250, 250–500, 500–1,000, 1,000–2,000, 2,000–4,000, 4,000–8,000, and 8,000–16,000 and higher. 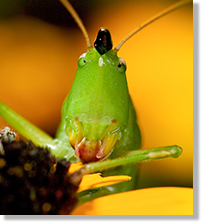 Most insect sounds occur in the upper two octaves of human hearing, primarily from around 4,000 Hz to 20,000 Hz. Thus, a young person with “normal” hearing will be aware of most of the insect singers in his surroundings. Unfortunately, high-pitched sensitivity gradually declines as we age, a phenomenon known as “presbycusis.” In fact, by age fifty, many of us are no longer very sensitive to sounds of 10,000 Hz and above. 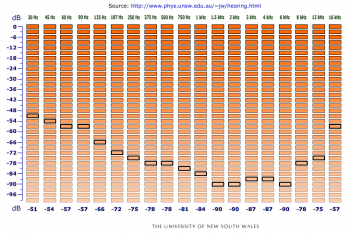 By age sixty, the situation worsens, and moderate to severe hearing loss above 5,000 Hz is not uncommon. The sad truth is that someone suffering from such hearing loss may hear only a small fraction of the insect sounds in their surroundings, even though perception of human speech remains relatively unaffected. 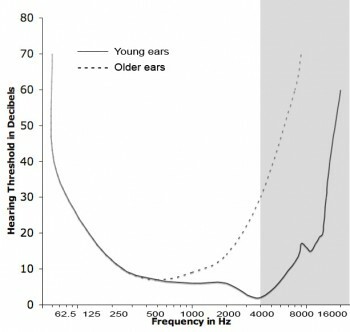 Hearing loss due to aging is not fully understood, but it may involve the continued unnatural exposure to the loud sounds of our modern society. Aspiring young naturalists and adults alike should do everything possible to protect their hearing. This means wearing earplugs in noisy situations, avoiding prolonged exposure to high noise levels, and shunning any activity that hurts the ears. Under no circumstances should one do anything that results in ringing of the ears, as this is a sure sign of nerves being damaged. Pictured are the results that Wil obtained using high-quality headphones and starting from the bottom of the columns. You can test your hearing on-line. This will give only an approximation of your hearing acuity. A certified physician is the only one that can truly measure your hearing and accurately determine how your hearing compares to standards. 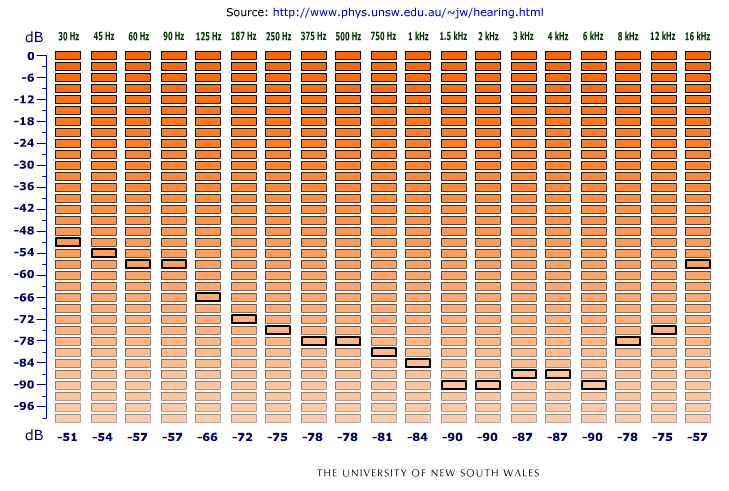 However, this on-line test is a fun way to see how your hearing is holding up. CAUTION — read the instructions carefully. Until recently, there was little someone could do to bring back the songs of the insects. Conventional amplifying-type hearing aids may help with the lowest singers, but such hearing aids are primarily designed to enhance speech perception at frequencies below 5,000 Hz — most insects sing higher than that. Various bat detectors are now available, and they should also work well with insects, especially those singing at the highest frequencies. Another solution is the SongFinder, a digital device designed for nature lovers that lowers high-frequency bird and insect sounds into a range where one’s hearing is still normal. Lord Shiva Sukadeva Narada Muni buy imitrex uk Brahma and all others are..